A while back I was shopping at a well-known store. This chain has thousands of locations across the globe. They have a branded card and at the time I was a card older. I purchased a lot of stuff as a card holder. I even had their top tier card. Immediately after that visit, I cancelled my card. Why? Well, while standing in line to pay, I noticed a huge promotional sign offering 25% off the product I was purchasing. When I asked the woman at the register to apply the credit she explained to me that the offer was only for new card holders – individuals that were signing up in store that day. I did not qualify because I was already a card holder. Did I need the 25% off? No. Did I feel left out in the cold by the company. Absolutely. This company was very clearly willing to invest in someone they didn’t have a relationship with but were not willing to invest in me – a loyal customer. I left the store, went home and shredded my card. Think about your business. Often, we provide aggressive offers to acquire a new buyer. We likely use lead pricing and discounts to get the person in the door. But do we pay as much attention to our loyal buyers? 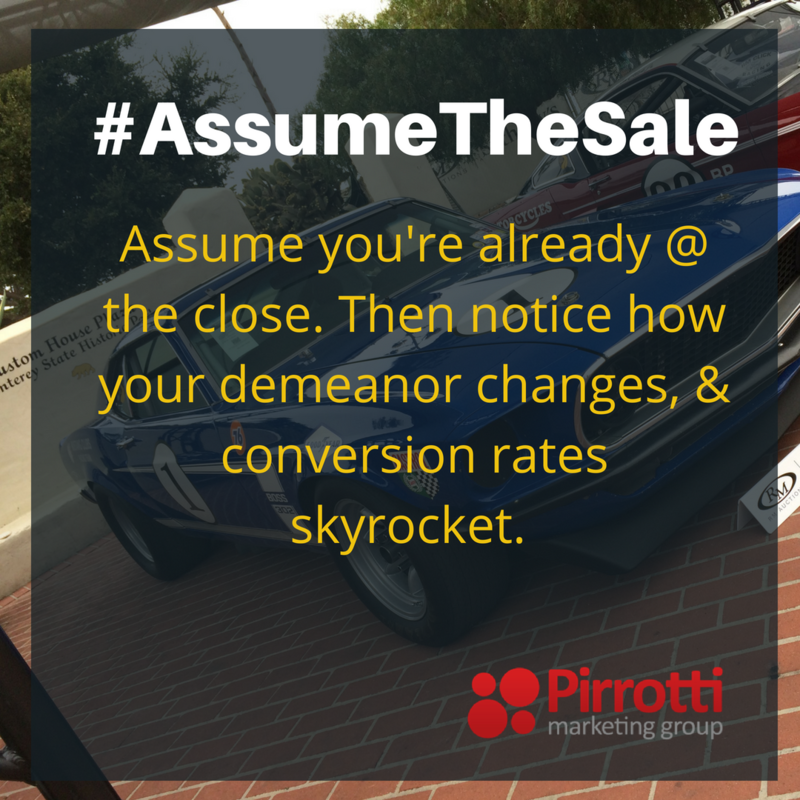 Many companies simply abandon these buyers after the initial conversion. Of course, that’s simply bad business. It’s expensive to acquire a new buyer – 10 times more than retaining a current buyer. I say, keep your cash in your wallet! So, what have you done for your clients lately? When we craft client retention strategies for clients, these three tactics are omnipresent. Annual Satisfaction questionnaires. Use this outreach to express your appreciation for their business. Reinforce the value proposition you provide and further validate why the buyer made their initial purchase decision. Then ask questions about their experience so that you can determine how you can further provide support. Carefully craft your questions to ensure that the answers offer a foundation for a future dialogue between you and the buyer. Satisfaction questionnaire are great for three reasons: (1) You will get a pulse on how your buyers feel and think about you. (2) You will use results for your sales and marketing materials. (3) You will identify demand for new products and services and then generate more revenue from your current buyers. Thank your buyers: Yes, it’s that simple. Send a simple thank you note or email. Use concise messaging (so the thank you gets read), to drive engagement: (a) Thank the buyer for the business. (b) Reinforce the buyer’s decision to … buy. (c) Drive further engagement with coupons or promotions. What a simple way to foster good will, drive trial and engage. Ask for Referrals: I know you’ve heard that when a person has a bad experience he/she will tell 10 people (it’s exponentially greater than that with social media), but a good experience typically is shared with one person or not at all. Well, with a little nudge, you can get more referrals and more engagement with your buyers. Go ahead, let your buyers know that you need their help to build your community / business / client base and that you want referrals. Then let them know they will be rewarded for their efforts! 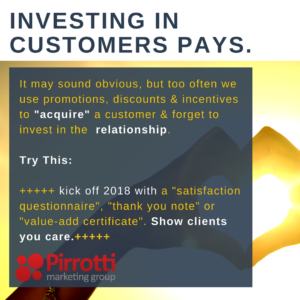 Investing in customers is just smart business. Dip your toe in the water with these three tactics. If you need more support check out our library of tools or give us a ring. We would love to help you be smart about getting more from clients. Let’s connect. Thank you to our daughter Sophia for taking this photo in D. C.